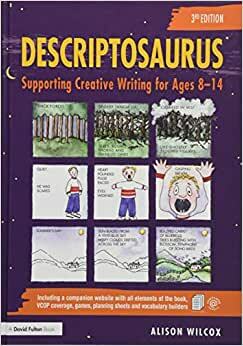 Now in a fully updated third edition, Descriptosaurus is the first book for creative writing that is a thematic expansion of a dictionary and a thesaurus; it provides children with a comprehensive resource with which to expand their descriptive vocabulary, experiment with language and sentence structure and build up narratives based around settings, characters and creatures. Descriptosaurus positions the word, zooms in on it to examine the meaning, expands it into phrases, and then provides alternatives in words, phrases and sentences; the model was created and refined over a number of years as a result of feedback from children inside and outside the classroom as to the resources they required to inspire and assist them with their writing. For reluctant writers or those faced with blank page syndrome, it provides essential starting points to encourage putting pen to paper, not only inspiring children, but also building their confidence, encouraging them to use, apply and create using the correct grammatical structures, and adding colour to their writing through evaluation and experimentation. New features for this updated third edition include: Sample poems Word banks and model sentences to provide a step-by-step process for development of vocabulary and understanding of phrase, clause and sentence structure Contextualised grammar and punctuation instruction and guidance Units of work where the models can be incorporated in a creative focus A companion website containing all the features of the book, games, planning sheets and vocabulary builders This is an ideal resource to dramatically improve children's creative writing for all KS2 primary and KS3 secondary English teachers, literacy coordinators and parents. It would also make an excellent classroom book for PGCE students, particularly Primary PGCE with English specialism. Alison Wilcox has extensive teaching experience in schools in England and Scotland. Colleagues describe her methods as `innovative and inspirational to even the most reluctant of writers'. Extremely useful, easy to follow.